One of the nice things about writing is the opportunity to hold up someone as an example to others and to give praise where it is long overdue. 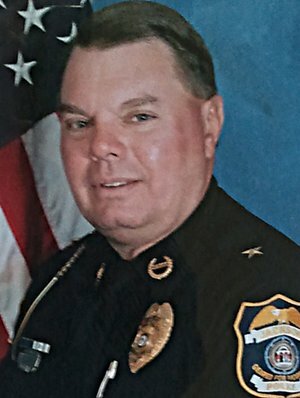 In a time where law enforcement officers are under fire every day and social media sways public opinion in every direction every few minutes, it is easy to overlook someone who has consistently striven to uphold the law and to exhibit the virtues of honesty, integrity and character that I have come to associate with Chief Mike Riley of the Jackson Police Department. For 21 years, he has stood watch over this small town of some 5000 people, keeping the peace while being a friend to all. Maybe people think that it has always been that way and it may be hard for some to remember what things were like in 1993 when he took the oath as Jackson’s newest police chief but I remember it well. I worked there then and had seen the department go through some of its most tumultuous and trying times. The department was at an all time low, morale was terrible and things were just pretty bad all around. That changed when Chief Riley was brought in by the Mayor and Council to turn things around and he didn’t waste any time doing it. The police department changed, internally and externally. Employees were empowered to put forth their ideas and when practical, he acted on them. He helped the employees gain pride in their work and at the same time, he changed the perceptions of the businesses and citizens about the police department so that they had pride in their police department. He did not do this alone and he would never take credit for doing it all but as the Chief, he led the department in changing its image and being a help to the community and not just an enforcer of the law. He and his department kept the peace by making the community a better place. He had literally been the Chief of Police for days when the “Blizzard of 93” struck, leaving the town without power for well over 24 hours. He made sure that people got home safely on the icy roads in town, got emergency workers to their jobs, made sure generators at key places like the hospital had gasoline and that things ran smoothly. He wasn’t home while his people worked…he was out there working with them and that is something I have never forgotten. In the years since, there have been many examples of the kindness and generous spirit that Chief Riley exhibited that helped him to become part of the fabric of the community. He was consistently involved and service went beyond just being the Chief. He would go on to help local organizations, the local school system and pretty much anywhere that he was needed. As much as he devoted towards looking after his town though, he gave equally as much to the men and women who he commanded. I’m not saying he was perfect. No man is and Chief Riley knew he wasn’t perfect but that didn’t stop him from serving and fulfilling his call to duty. You could count on the Chief to always represent his City well while always wearing his uniform and badge with pride. He saw the badge as more than just a piece of metal but as a symbol of public trust, infused with integrity and burnished with responsibility. He never took it lightly. I did not get to work for him very long because of opportunities at my other job with the county but this just allowed me to work with him afterwards in the public safety arena. We worked together on the 911 Board, Emergency Management efforts and many other things over the years. Even though we both wore different uniforms in those years, we respected each other’s work and I must admit that when I knew Chief Riley was going to be around that I had better make sure my uniform was correct. He would notice if it wasn’t. Every Christmas, you could count on him to be out on the streets of Jackson collecting canned goods for the annual can-a-thon and at every local festival, event, football game and more, you were sure to spot him in the area, speaking to people and making them feel welcome to Jackson. Consistency is a good thing, seldom appreciated when it is there and often missed when it is suddenly not. Chief Riley’s career in law enforcement goes back even further than his years as Chief. For many years, he worked as a Deputy Sheriff under the late Billy Leverette and I may be wrong but I believe he was the first person to ever be appointed as an Investigator when our county became large enough to warrant one. Even then, he was recognized and appreciated by citizens for his fairness, honesty and his willingness to help everyone, even those who strayed from the legal path. He put many back on the right path over the years. This week, Mike Riley made the decision to make a change and after two decades of service as Chief of Police, plus many more to the citizens of the county before that, he will be standing down and hanging up his badge. He follows a number of honorable men, now long in the past, who served in his position once and who left Jackson Police Department a better place than when they found it…men like Watson Vaughn and Gerald Davis, who also stood for the values he believed in. He has invested many years of his life toward making Jackson a better and safer town, for which it has been recognized. He introduced modern police methods to the department and brought it out of the old days into the new. He will leave things better than he found them and he will leave some very big shoes to fill. I hope in the weeks ahead, that the town, community and county that he has given so much to will show him the appreciation he most certainly deserves. He has never asked for that but he surely is worthy of it. I’m reminded of the scripture that is so well-known and so appropriate at this moment, from the book of Matthew: Well done, good and faithful servant. I think that sums the Chief up pretty well. Wherever he chooses to go and whatever he chooses to do next, I for one wish him nothing but the best and I thank him for being an example to me and to so many. Chief Riley gave me my start in law enforcement like he did so many others. He was a kind boss with a way of teaching you like a parent would. He is all the things J M Brewer said and more. A true servant to this wonderful community I grew up in and love. When you told him something his favorite response was “that’s right”. I wish you well Chief and I have a ton of love and respect for you. God Bless you on your next endeavors. Blessed are the peacemakers.